“Years ago I decided that the greatest need in our Country was Art… We were a very young country and had very few opportunities of seeing beautiful things, works of art… So, I determined to make it my life’s work if I could.” Isabella Stewart Gardner, 1917. One of the loveliest and most interesting art museums that I have ever visited is just a few stops on the ‘T’ from downtown Boston. 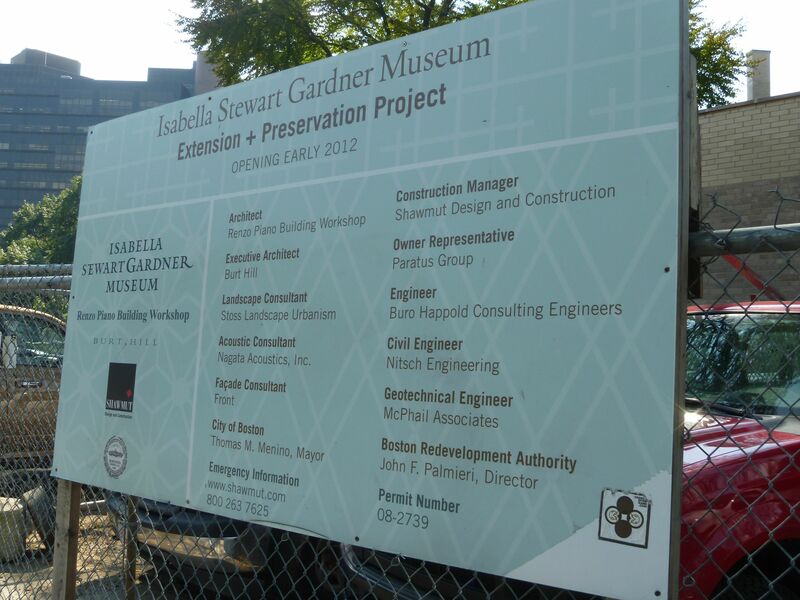 The Isabella Stewart Gardner Museum is currently undergoing change. Not too sure what Mrs Jack Gardner would make of that but there you go. We’re told on the audio guide that she planned the whole place herself from the building to the purchase of the works of art themselves to where she meant them to hang and then left strict instructions that that was how it was to stay. 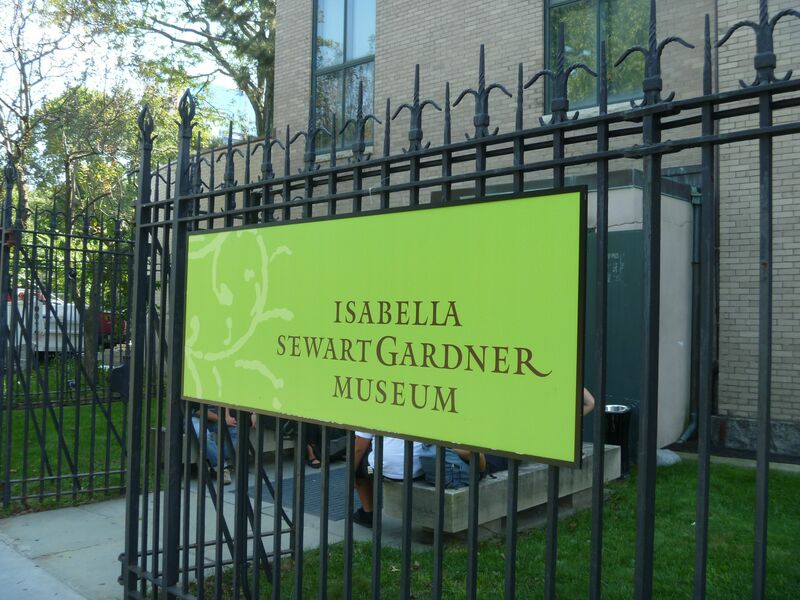 Isabella Stewart was born in 1840 in New York and married John (‘Jack’) Gardner in 1860. They travelled widely and ‘Mrs Jack’ developed an interest in art which turned into a passion for collecting after her father left her his entire fortune when he died in 1891. Jack died in 1898 and she continued to collect, purchasing some land on Fenway and designing and planning the museum just as it is today. It opened to the public in 1903. She died in 1924. The Museum centres on the dramatic Japanese-style courtyard full of greenery and mosaic tiles which is in such great contrast to the darker rooms through which you approach it. On three floors each room has a theme of its own from The Titian Room to the Blue Room and the Yellow Room through to a Tapestry Room and a Gothic Room. Due to the work going on just now some of the rooms were closed and others had items removed. 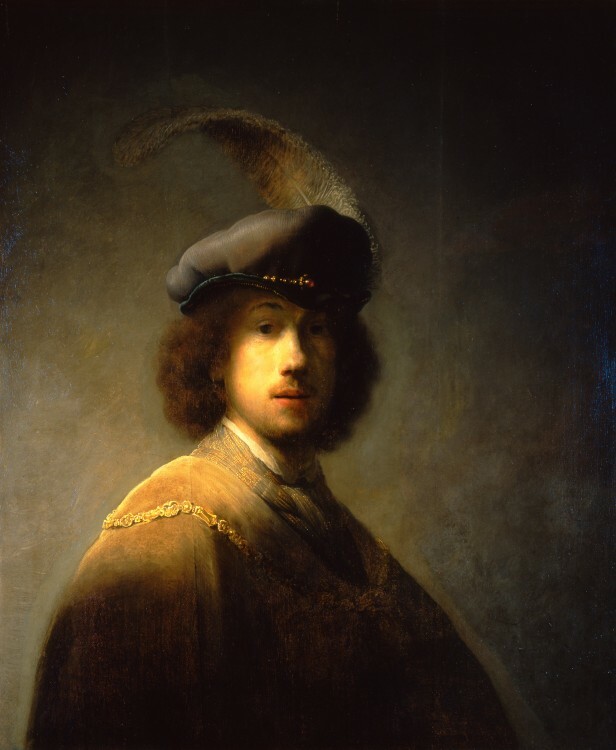 My favourite room was the Dutch Room where an early Rembrandt self portrait hangs. But when you enter the Dutch Room you are also in for a shock. There on the wall hangs an empty frame – where once Rembrandt’s ‘Storm on the Sea of Galilee’ was hanging. In 1990 the ISGM was victim of the largest single property theft in the world. None of the works of art has yet been recovered. The Yale Guide, by H. T. Goldfarb and a biography of Mrs Jack by Louise Hall Tharp. No fridge magnets, no rubbers, no pens and not even one postcard! 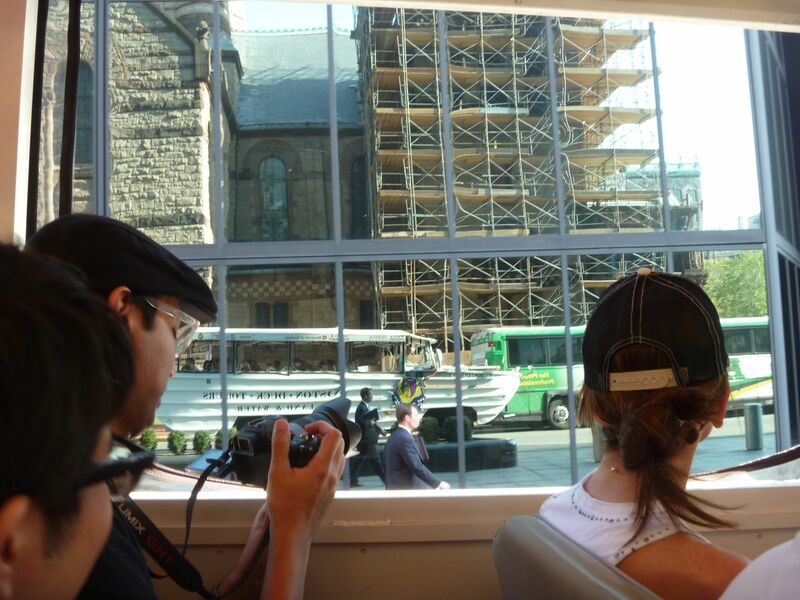 Then, from the sublime to the ridiculous, I fulfilled a long term wish of mine since first seeing it in 1995 – I went on DUCK TOUR! There we are reflected in office windows on Copley Square! 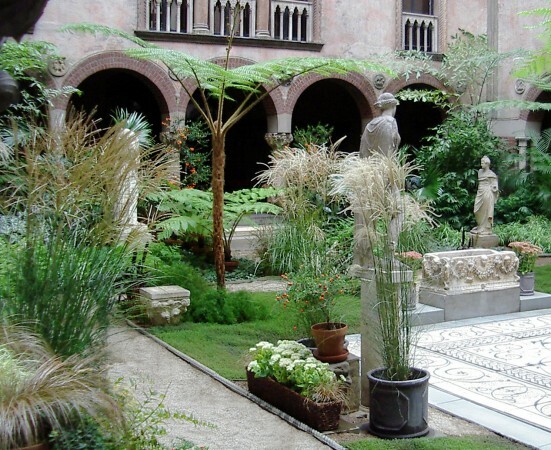 This entry was posted in Milady gets culture, Milady ventures overseas and tagged Art Galleries, Boston, Gardens, Museums, New England. Do put Mr’s Jack’s biography on your TBR list! It’s fascinating. She’s a very colorful character. Sherry, needless to say it is on the list already. Will be buying very soon now if it also meets with your approval. oh yes! Maybe I can find a copy for you. There’s a book sale next week. umm. it’s dangerous for me to go to a book sale. I think, yes, please, if you see one. How lovely to find a kindred spirit – we love exploring art, history and literature – and taking photographs too. an arty heart … ! This is fascinating Barbara, I had no idea who ISG was but have dipped into Pushkin Press’s lovely little volume of letters to her from Henry James and thought I really must find out more. Now I can read them with some pictures in my mind. So sad about the theft. And currently reading Vermeer’s Women I think I see that one of his paintings from this museum is currently in the exhibition at the Fitzwilliam in Cambridge?? I wouldn’t have made the connection but for this post, so thank you again Barbara, I learn things here obviously! Well, I’m quite surprised about that, Lynne, because Mrs Gardner was adamant about nothing being moved or added etc. There again they are currently building an extension and it looks to me as they will be bending some of her rules. The Vermeer’s Women looks good but I’m not likely to get there as I spent 2 nights in Cambridge in February this year. I remember that empty frame… I would love to revisit one day in the future. Yes, gaskella, sadly it is still there, although I read in the guide or heard on the audio that they have not given up hope of its being restored to its rightful place for all to enjoy. Thank you for your visit.